Covered call writing is a stock option strategy with primary goals of income generation and capital preservation. Most of us are conservative investors who use the power of education to master an investment strategy better than most everyone else using the same strategy. That is what the Blue Collar Investor is all about. Using in-the-money strikes is our most commonly used approach to protecting ourselves against share depreciation. We are generating downside protection of the time value of the premium, a perk paid for by the option buyer, not us. 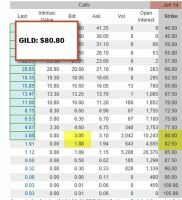 If we sold a $30 call on a stock currently trading @ $32 for $3, our initial profit is 3.3% ($1/$30) and that profit is protected by the intrinsic value ($2/$32) = 6.25%. In other words, our share price can drop by 6.25% and we would still generate a 3.3%, 1-month return. Our premium watch list gives beta stats and historically low-beta stocks tend to outperform in bear market situations. As an example, lower your monthly goals for initial returns from 2-4% to 1-3%. This means that the implied volatility of the underlying securities is less and therefore carries lower risk. ETFs or exchange-traded funds are baskets of stocks with some going up and some going down. As a whole, and generally speaking, these securities have less implied volatility (IV) than individual stocks. In our weekly ETF Reports for premium members we also give IV stats for our ETFs and you can tailor your portfolio to your personal risk tolerance and overall market assessment. Here, too, I would lower my goal to perhaps 1-2%. Our initial options credit is cut in half but we are protected against a catastrophic price decline below $45. We can now write a call on this stock and select a strike based on all the parameters detailed in my books and DVDs. I will be discussing this strategy along with many other put-selling strategies in my upcoming 5th book about puts, now being edited. One of the advantages of covered call writing is that it can be molded and modified to meet the challenges of current market conditions. An elite and educated covered call writer, which is where I want all of you to be, will change the strategy approach based on overall market assessment, chart technicals and personal risk tolerance. One size does not fit all. For the week, the S&P 500 was flat for a year-to-date return of 2%, including dividneds. BCI: This site remains bullish on the overall economy. This was confirmed by the positive housing data and respectable earnings reported in the recent quarter. Earnings increased by an average of 5% for S&P 500 companies and sales grew by 2.8%. The average S&P 500 company beat consensus estimates by 6% according to Bloomberg. However, because of recent market volatility, we are taking a relatively conservative stance and selling an equal number of in-the-money and out-of-the money strikes. I have been reading your book and subscribed to your newsletter. I am trying to write my first covered call but it turns out it is more difficult to write a call than I thought. I looked through a couple of the stocks on the watch list, and I am having difficulty picking a combination of strike price, exportation date, open interest > 100 with ROO > 2%. Is that normal? In fact, I see a lot where the strike price is lower than calculated intrinsics. For some reason I assumed there were plenty of options with ROO > 2%. Am I mistaken or am I looking at things improperly? The May contracts expired yesterday. As you approach expiration Friday the time value of the option premiums approach zero. You need to look at the JUNE option chains. You will find plenty of covered call opportunities that meet your goal. 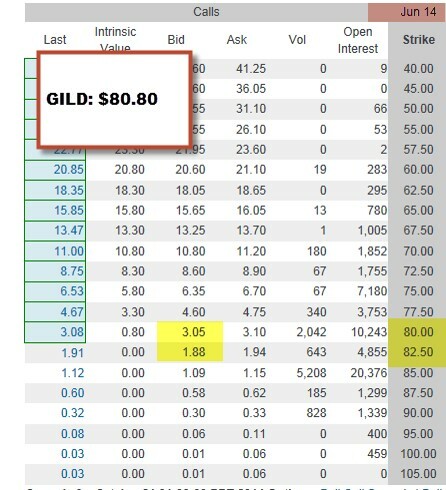 Below is a screenshot of the options chain for GILD, a stock on last week’s Premium Stock Report showing 2 strikes that meet your goal. This week’s report will be published on the premium site late today or tomorrow. Use that report for any positions you are considering for next week. CLICK ON IMAGE TO ENLARGE & USE THE BACK ARROW TO RETURN TO THIS BLOG. The Weekly Report for 5-16-14 has been uploaded to the Premium Member website and is available for download. Why do brokerages have a higher level of trading approval for selling puts than for covered call writing when the two strategies are basically the same? Hoping you can shed some light on this. The two strategies are quite similar but not precisely the same. I, too, wondered why the higher level of trading approval for put-selling and so at the last Money Show event in NYC I surveyed many different online brokers asking that very question. The typical response was a blank stare…”good question” I was told. The best response I was able to generate from this group was that covered call writing was more intuitive to average retail investors. For example, if a stock is trading @ $48, an OTM strike might be $50. For the same stock an OTM put may be $45. Another possible example is that stock prices and call premiums are directly related (all other factors remaining the same) while they are inversely related to puts. Many brokerages have been getting sued since the recession of 2008 and are quite concerned about giving trading approval to only those who are appropriate for the strategy. Right or wrong that’s the best explanation I could muster up. I started trading ILMN when I found it on your stock list a few months ago. I bought at 73 and the price went to 180 and then down to 140 and today its up to 150. I held it throught the downturn in march because my cost basis was so low writing out of the money options. Is this a viable strategy when the cost basis is so low? This one has been very strong and a great money-maker for many BCI members (including yours truly). You treated this stock as I describe in a gap-down situation when you use “technical nullification” because you have so much faith in the underlying. I prefer to ignore my cost basis and make all decsions based on current information and which equity gives me the best chance to generate the most income. It may or may not be the security which has made us a lot of money in the recent past before the decline. 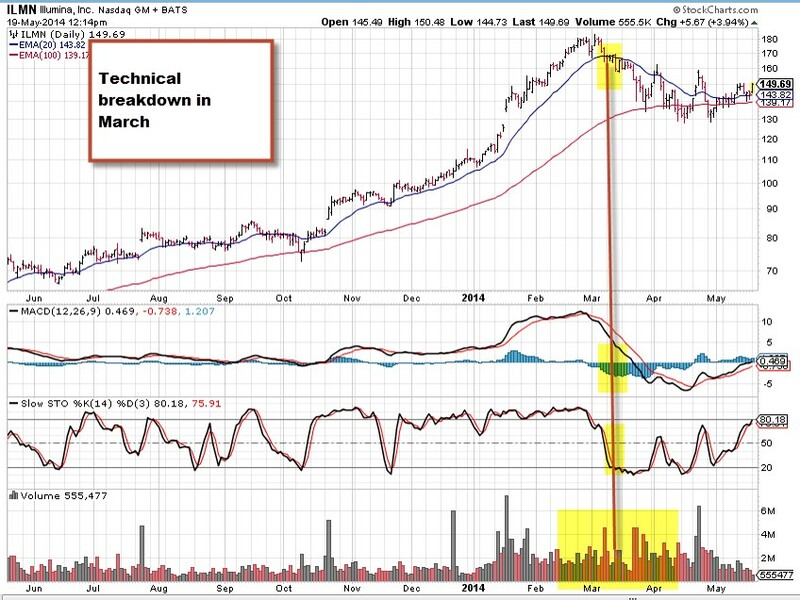 In March, the stock had a complete technical breakdown as shown in the chart I created below. The best way to handle these scenarios (generally) is to manage as described in my books/DVDs (rolling down, CDMCP) and using the cash to enter a new position until the stock recovers and becomes a stronger candidate as it is now. That said, if you utilized all the BCI management tools, I’m sure you still had stellar results. I have a question for you related to your Beginner’s Course Lesson 7, Exit Strategies, and how it could potentially lead to a wash sale. When rolling down like shown above, our total profit is $135 + 200 = $335. However, let’s say the stock closed at $25.01 or higher and was called away. This would have resulted in a $350 loss and a wash sale, correct? How come in your roll-down scenario you didn’t recommend to buy back the $25 call? I’m faced with this exact scenario in my paper-trading account. I bought the security at a recent peak and continue to sell lower strike calls against it but am always cautious to buy back the call. The unrealized loss in value of the underlying is unfortunately greater than the total of the premiums I’ve collected with each sale. As the price of the underlying continues to decrease, the only way I can create income that doesn’t result in a wash sale is to sell OTM calls that are further and further away from the current date. How do you address the possibility of wash sales when dealing with the roll-down exit strategy? Since I am not a tax advisor, let me premise my response by saying that you should speak with a tax expert before taking on any investment obligations. The wash rule applies to “sustantially similar securities”. When rolling down, we are selling different securites because of the lower strike prices. If the stock is called at a loss, the wash rule will not apply unless we re-purchase that security or an option that gives us the right to purchase within a 30-day window. I wanted to ask you if it is possible to set a stop loss after selling a call option. I would think that it is not possible because first we would have to buy back the option to be released of the obligation….is that correct? (that is, know in advance the maximum we are willing to lose) other than protective puts and selling cash secured puts? After entering your cc trades set limit orders to buy back the short call based on our 20/10% guidelines (see pages 251 – 254 of the Complete Encyclopedia…). Instruct your broker to email notice should any trade be executed. Then you are prepared to take the appropriate action based on the criteria edstablished in our exit strategy plans. Thanks a lot Alan, thanks to your etrategy so far I am getting oustanding results! One more question: Suposse we buy to close when the 20/10% guideline is met. We have 4 Exit Strategis we can perform then (rolling down, hit a doubble, convert dead money into profits and do nothing). In “hit a double” you recommend waiting (about a week ) before reselling the option. Do you think that it is a good idea to set a stop loss until then, as a way to make sure you wont lose more money than you are willing? (in case of events like 11-S or others that could make the market crash in a short period of time). Once the short position is closed, setting a stop loss order on the stock side is a viable approach. Many investors use an 8-10% range. If share price continues to decline we can either roll down and mitigate losses with the time value of the lower strike or sell and use the cash to initiate a new position. If the stock is under-performing the overall market, I am more likely to sell. If not, rolling down is more likely. As far as major events like 9-11, sometimes a stop order may not work as the price can gap down below the set limit so you may not get the price you were counting on. Fortunately, these events are rare. Instead of using a percentage drop as Alan suggests, you might want to look at where historical support has been strong and use that as a potential exit target. Support and resistance are excellent tools, as well as moving averages for support. In a 9/11 type event, you may blow through your stop on the way down as Alan suggests. A way to give you the price that you want is to use a protective put. Although this will increase the cost of the trade, it guarantees you your exit price, no matter how far the stock drops. Thanks a lot Alan and Barry. Personally I prefer also to use supports instead of %, and you are absolutely right that in rare events the price will probably gap down. I am learning to use protective puts and sell cash secured puts from your documents, and it seems like a great idea to have higher control o our investments in uncertain times. 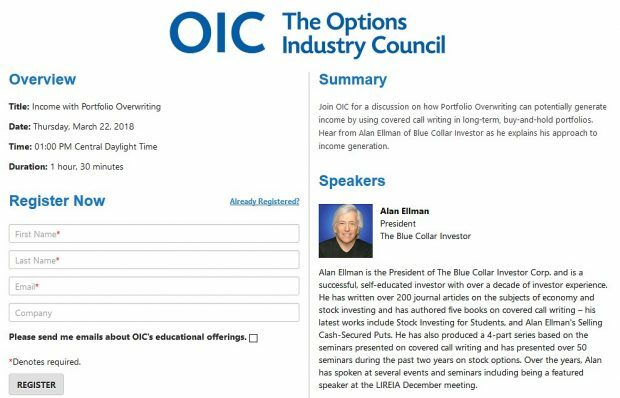 Alan, one final question: in the Mid – contract unwind-stock price goes up, do you have a percentage or range of percentages that the stock must go above the stock price you paid initially, so there is a good chance that we can execute this strategy when loading the information in the Ellman calculator? (Where we will make sure that it meets our conditions: 1st part of the contract, premium with almost no time value, time to open a new position…). I ask this because when a stock goes up in the first part of the contract, I always wonder if it is enough to execute the strategy, but can only find out loading all the info in the calculator. Do you have a guide line? 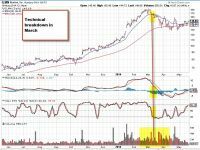 Although related, it is more the option premium breakdown rather than specific share value that will dictate when to institute the MCU exit strategy. The question we ask ourselves is this: Can we generate more income in a 2nd position than it costs us to close the original position? As the time value approaches zero as share price rises and leaves the strike deep in-the-money, the opportunity for the mid-contract unwind exit strategy increases. There is no one formula for every stock as implied volatility will play a role in the premium breakdown. Then see if a new position can generate a higher %. 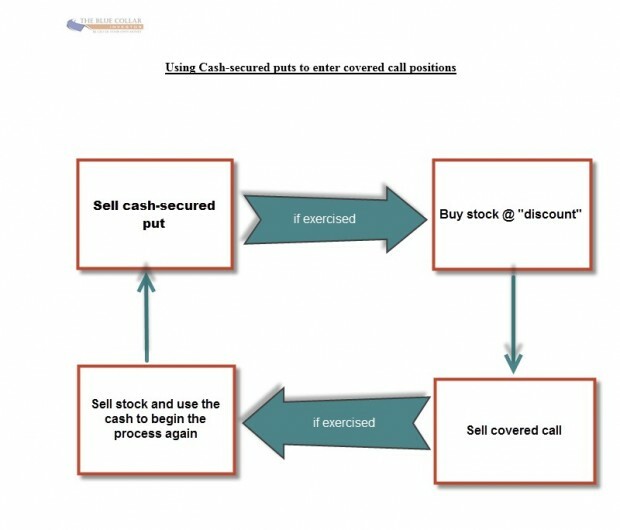 How do you select the strike price for weekly cash secured put selling and weekly covered call selling? For covered call writing, I select strikes that return 2 – 4% of time value and base the ITM vs. OTM strikes on my overall market assessment. chart technicals and personal risk tolerance. This information is detailed with specific examples in my books/DVDs.